The PTI QuantaMaster™ 8000 Series of steady state, and lifetime spectrofluorometers offer the world’s highest sensitivity specification with safety, cost and energy consumption benefits. 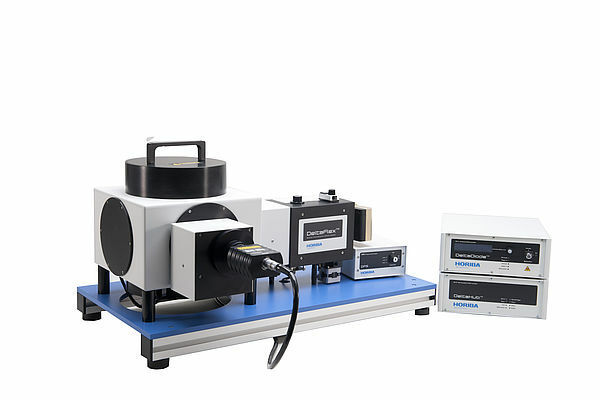 The PTI QuantaMaster™ 8000 Series of modular research-grade spectrofluorometers are multidimensional systems for photoluminescence measurements. 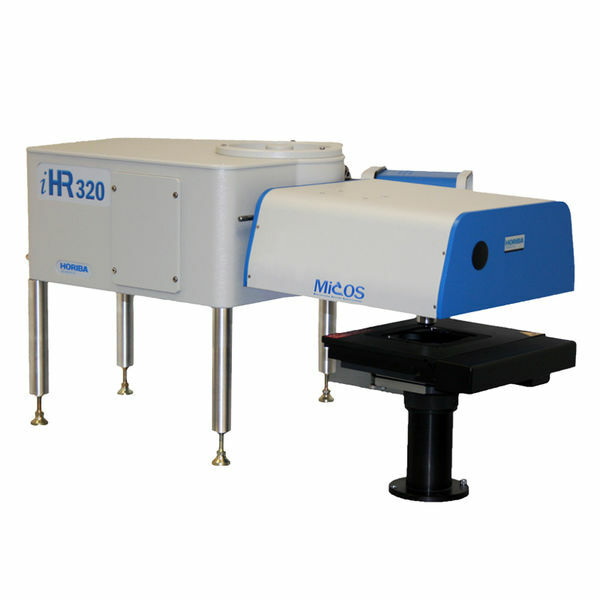 It ensures you get the best possible results for steady state intensity measurements, time-based experiments, synchronous scans and polarization. All that with high sensitivity, spectral resolution and stray light rejection. This level of sensitivity is achieved using a xenon illuminator, providing safety, cost and energy consumption benefits not found among competitor’s products. 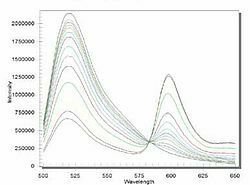 The PTI QuantaMaster series is adaptable to every research need with TCSPC fluorescence lifetimes, upconversion lasers and phosphorescence detection of up to 5,500 nm. Two years after the acquisition of Photon Technology International (PTI), HORIBA is proud to introduce the new PTI QuantaMaster™ 8000 series of fluorometers. 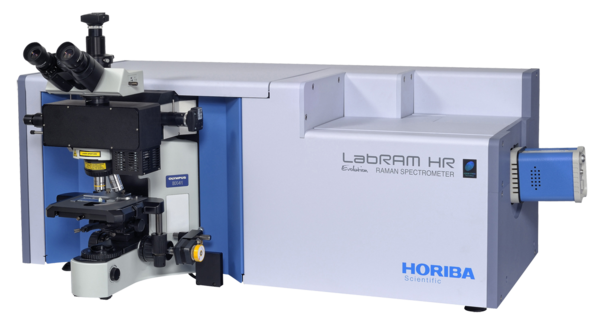 The new PTI QuantaMaster 8000 series modular research fluorometers from HORIBA Scientific offer the world’s highest guaranteed sensitivity specification, plus many unique benefits. 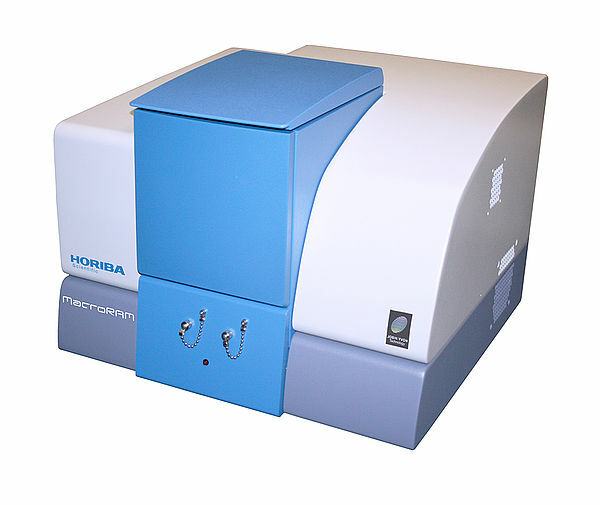 Only the HORIBA Fluorolog 3, also from HORIBA Scientific, matches the sensitivity of the new QuantaMaster 8000 series. Water Raman spectrum of the PTI QuantaMaster, resulting in a signal to noise ratio of 30,000:1! 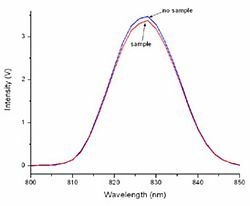 Experimental conditions: λex = 350 nm, Δλex = Δλem = 5 nm, int = 1 s.
The industry standard for sensitivity is a signal to noise ratio calculated from a water Raman spectrum. 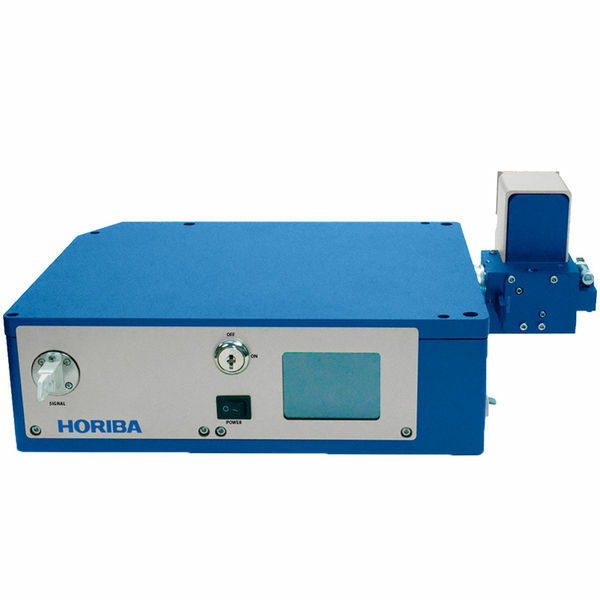 Using this standardized test (see our technical note "SN Determination for PTI QuantaMaster Fluorometer,") our signal to noise ratio is the highest sensitivity in the world, matched only by the Fluorolog3, also from HORIBA. The extreme sensitivity of the PTI QuantaMaster fluorometer is even more remarkable because it is achieved with the lowest wattage lamp in the industry. This remarkable achievement is a result of the intelligent engineering of the unique PowerArc™ arc lamp illuminator featuring an ellipsoidal reflector with the highest possible light gathering efficiency of 67%, and focusing the light in a tight spot at the monochromator slit. As a result, the standard 75W Xe delivers light to the sample more efficiently than higher power lamps featured by other instruments. This reduces energy waste and excessive heat generation by an overpowered light source, not to mention cost, while exceeding the sensitivity of all competitors' designs. Another contribution to the high sensitivity of the PTI QuantaMaster comes from the asymmetrical, aberration-corrected monochromator, optimized for the best light throughput and stray light rejection. Want a higher wattage light source? Suppression of stray light is one of the most critical factors when measuring highly scattering, or low quantum yield samples. Every PTI QuantaMaster series spectrofluorometer is custom made with the highest quality optics to insure the lowest amount of scatter. The standard asymmetrical Czerny-Turner monochromators are coma-corrected and individually optimized for purpose as either excitation or emission monochromators, ensuring the lowest amount of stray light contamination for the best detection of the true fluorescence signal. These monochromators boast an impressively high stray light rejection of 1x10-5 in a single excitation monochromator configuration. 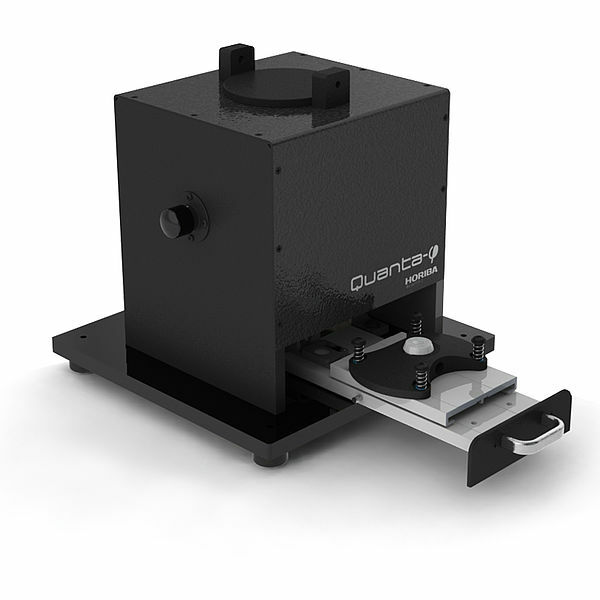 The excitation and emission monochromators in the QuantaMaster can also by upgraded to double additive monochromators, improving the stray light rejection to 1x10-10. The QuantaMaster also offers an optional order sorting filter wheel for rejection of second order signals from large spectral scans. This ultimate stray light performance was motivated by an increasing demand for photoluminescence spectrometers in materials science, where strongly scattering samples, such as powders, wafers and films, are routinely used. Very low stray light performance will also benefit researchers working in biological, biomedical and environmental areas where cell suspensions, protein and biomembrane solutions, or soil samples, generate high levels of scattered light. 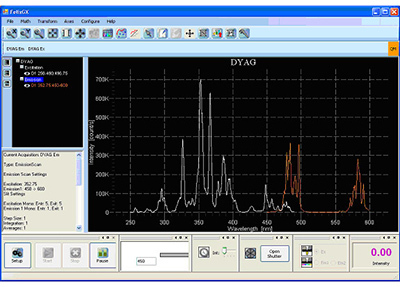 Emission scan of dysprosium-doped YAG crystal measured at 78K in software controlled LN cryostat illustrating excellent resolution of narrow spectral lines attained at low temperature. Resolution is of utmost importance to photoluminescence research. 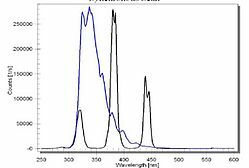 High quality resolution can reveal detailed spectral features which are indispensable for applications in materials science and analytical chemistry. Resolution is the key to detecting very narrow lines, which is necessary to study fine interactions in inorganic materials and crystals. The PTI QuantaMaster yields high quality resolution due to innovative optical design, and very minimal optical aberrations. 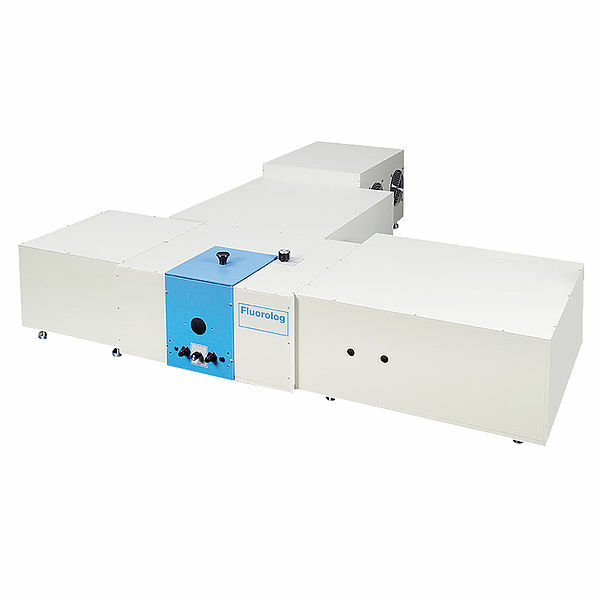 The PTI QuantaMaster spectrofluorometers use a precision-driven asymmetrical, length Czerny-Turner monochromator with a triple motorized grating turret and motorized flipping mirrors. More than 30 different gratings are available. Due to the combination of the computer-controlled motor with micro-stepping resolution and available grating selection, it is possible to achieve a minimum 0.022 nm step size. 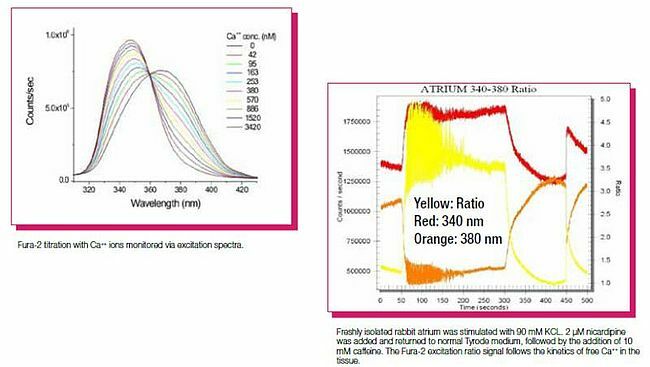 This means that within the UV and VIS spectral regions, you can resolve spectral features well below 0.1 nm. 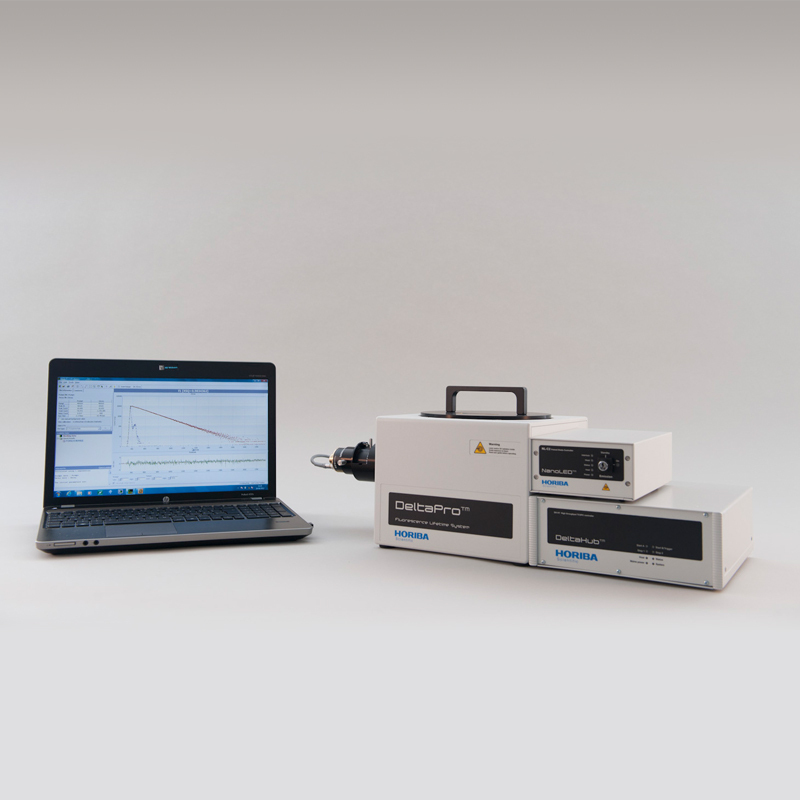 The PTI QuantaMaster series of modular research grade spectrofluorometers are multidimensional systems for photoluminescence measurements. The foundation of a fluorescence spectroscopy laboratory is built on steady state intensity measurements such as wavelength scans, time-based experiments, synchronous scans and polarization. The PTI QuantaMaster series ensures you get the best possible results for all these measurements with high sensitivity, spectral resolution and stray light rejection. This level of sensitivity is achieved using a unique xenon illuminator, providing safety, cost, and energy consumption benefits not found amongst competitor companies. These conditions make the PTI QuantaMaster system more than capable of meeting the highest demands of research. The PTI QuantaMaster system is adaptable to every research need, with additions such as TCSPC lifetimes, upconversion lasers and phosphorescence detection up to 5,500 nm. 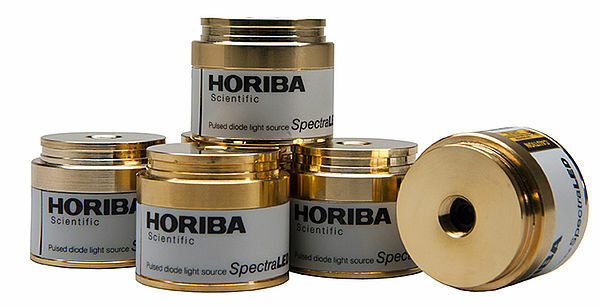 Using the pulsed light source allows for not only spectral and kinetic fluorescence and phosphorescence measurements, but also the measurement of lifetimes in the microsecond to seconds range. 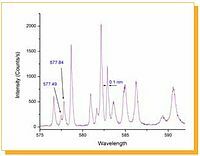 This addition is especially beneficial when using fluorescent probes prone to photobleaching, and when characterizing inorganic material with longer lifetimes. The modular design of the PTI QuantaMaster ensures that your system can be easily adapted to your growing research needs. 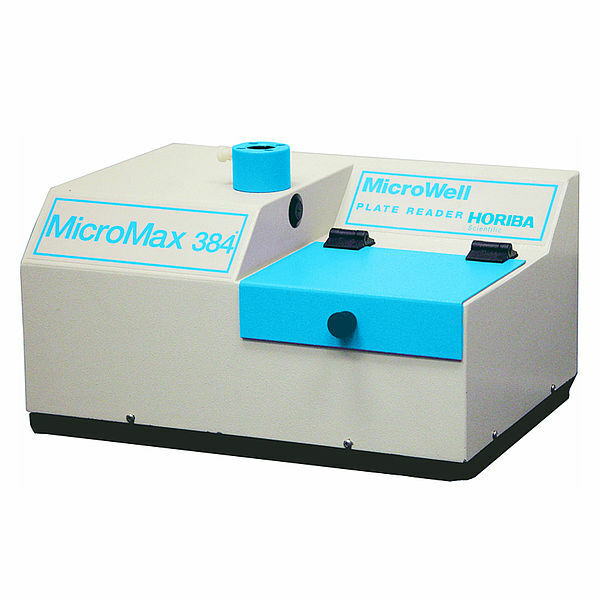 Microsense microliter fluorescence measurement solution - Easy to deposit, easy to recover, easy to clean. Fully automated Peltierbased temperature control (-25°C to 105°C) for up to 4 samples measured at pre-set temperatures, or with temperature ramping and simultaneous measurement at all 4 sample positions. Magnetic stirring included. Universal Sample Holder Base, capable of both linear and rotational travel, was designed for the measurements of solid compounds, microscope slides, or films. The solid sample holder head, also suitable for slides and films, mounts onto a base and can be removed easily to substitute a powder sample holder head or a cuvette holder which enables front face measurements. The cold finger dewar accessory is designed to be used with liquid nitrogen as coolant (77 K). Includes: quartz cold finger dewar that accepts 5 mm tubes, dewar holder for the sample turret or single cuvette holder, foam lid for the dewar and extension collar with altered sample chamber lid, and a sample compartment. The dewar features a suprasil quartz cold finger that passes light down to about 200 nm. Samples are placed in NMR and EPR tubes, and the liquid nitrogen placed in the dewar will typically last several hours. Titrations are performed to measure a number of biochemical and physical parameters, including binding constants, stoichiometry and kinetics. 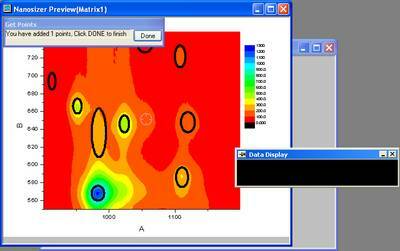 PTI offers fully automated titration solutions that are integrated into the software. Parameters such as mixing, volume, speed, and calibration are dictated in the software and can be adapted to your needs. 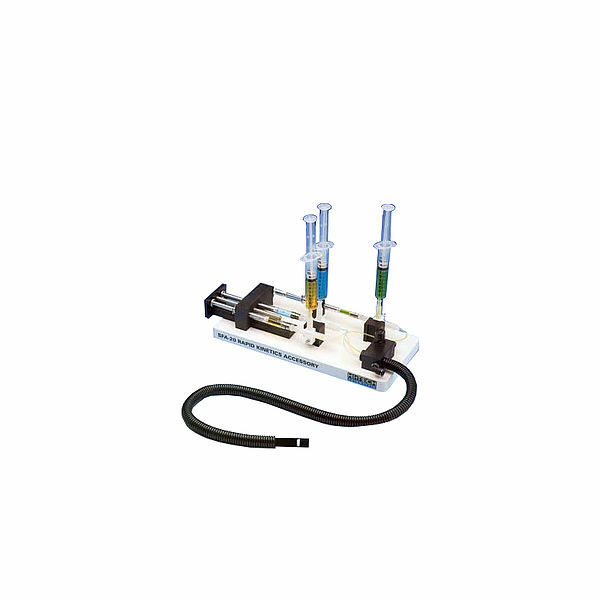 The stopped flow accessory is used to rapidly mix small volumes of two (or more) different chemicals in a cuvette, quickly stop the flow of chemicals to the cuvette, and monitor the resulting chemical reaction via optical means. In some instances, the chemical reaction will result in luminescence, and this optical signal can be monitored using a fluorometer. In other instances, the chemical reaction only produces a change in the optical absorption properties and must be monitored using an absorption technique. The primary experimental interest is in the speed of the chemical reaction following the mixing in the cuvette, in addition to the spectral properties of the resulting absorption and/or luminescence. 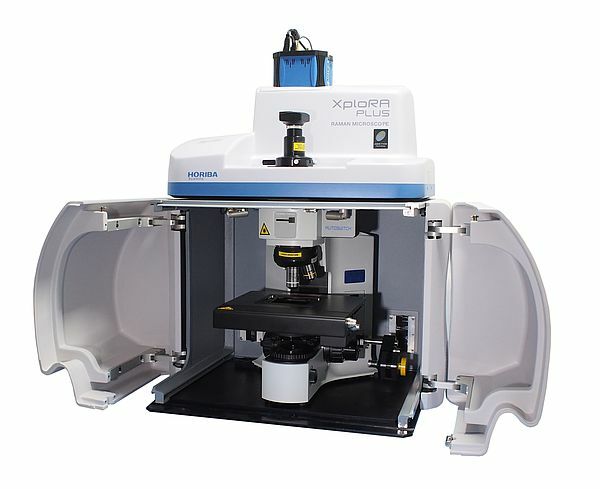 The Cryostat can be used between the temperatures of 77 K up to 500 K. PTI FelixGX can control the cryostat remotely to allow computer monitoring of steady state and lifetime measurements. The muscle strip is inserted into a standard 1 cm cuvette, combining the lower muscle hook with unique perfusion tubes, a tension transducer with upper muscle hook, and an interface electronic control unit. 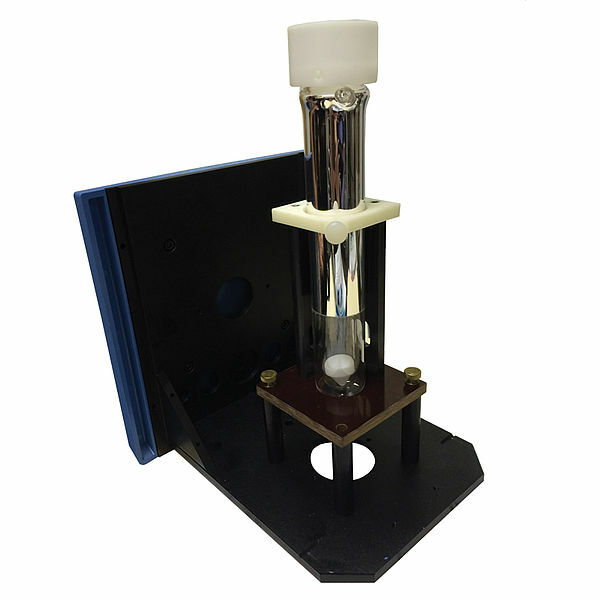 The accessory can be used with any cuvette-based fluorescence system having a standard single cuvette holder complete with tension transducer and transducer mounting bracket with micrometer position adjustment. The Peltier-based temperature control with magnetic stirring provides unmatched temperature stability and full software control from -40°C to 105°C, including temperature ramping experiments. PTI offers a wide variety of polarizers, ranging from manual sheet polarizers to automated large aperture Glan Thompson polarizers. All configurations allow for automated software control, automatic G-factor determination, and real-time acquisition of HH, VH, VV, and HV analysis. Measure steady state anisotropy in a single emission configuration or dynamic anisotropy utilizing our dual emission configuration. Incorporate TIRF flow cell into a PTI system by replacing the standard sample holder. Includes two reusable UV silica TIRF prisms, twenty reusable silica TIRF slides, two plastic fluidic blocks, a set of ten elastic gaskets, and a Teflon cassette holder for cleaning and chemical modification of ten TIRF slides. The ABS-ACC absorption accessory fits directly into a cuvette sample holder and enables the user to measure the absorption spectrum or check the optical density of the sample without reconfiguring the PTI QuantaMaster fluorometer. 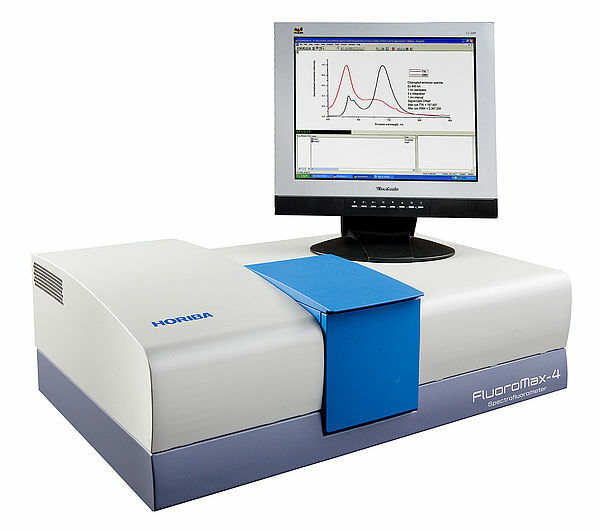 Quanta-phi - Quanta–φ expands your fluorometer into a complete quantum yield system! When combined with a HORIBA Fluorometer the Quanta-φ forms the most accurate, versatile and complete luminescence yield system available! Petite Integrating Sphere: Easy to use 3.2-inch Integrating Sphere that can be installed in seconds, replacing standard cuvette holder - no optics change or LLG coupling required. Easily removable top enables changing samples in seconds. It can accommodate regular cuvettes, slides and powders, with all 3 holders included. The remote sensing accessory allows in vitro or in vivo measurement by means of a quartz bifurcated fiber bundle or Liquid Light Guide. One fiber leg is attached to the second exit port of the excitation monochromator to provide excitation light to the sample. The second leg is attached to an open entrance port of the emission monochromator to detect the fluorescence signal emitted from the sample. 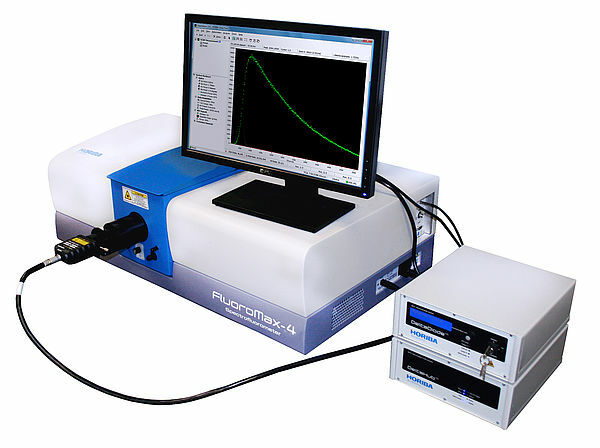 PTI QuantaMaster fluorometers come with our own software for the control of the instrument and accessories, which includes analytical functions for trace manipulation, and spectral and kinetic analysis. Through the powerful ASOC- 10 USB interface, PTI FelixGX provides a full set of data acquisition protocols, and controls the hardware for all system configurations and operating modes. 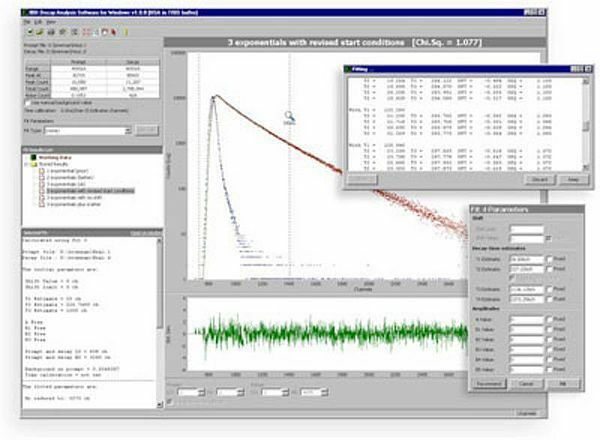 PTI FelixGX comes equipped with Macro capabilities to allow for automated measurements. Choose from a list of actions to make a chain of commands, or set up a loop function to eliminate the need to constantly change the acquisition settings. Set up the automation job and simply walk away, letting PTI FelixGX execute your demands. PowerFit-10 output graph with residuals and autocorrelation. 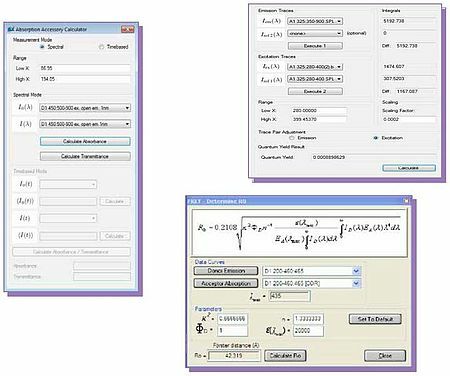 PTI FelixGX also offers a special set of software functions, such as quantum yield, absorption, FRET and color coordinates calculators, as well as the software that calculates structural parameters for single-walled carbon nanotubes. These are very convenient additions to some accessories, such as the integrating sphere or absorption accessory, and are also indispensable for some fluorescence applications, such as intermolecular interactions (FRET) and materials characterization. Absorption measurements are complementary to fluorescence. 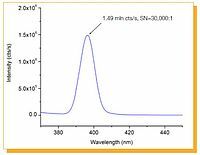 They are necessary for fluorescence quantum yield determination and are an easy and convenient way to check the fluorophore concentration. 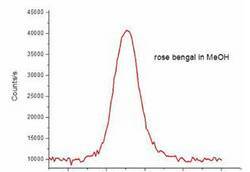 You can compare the absorption and excitation spectra to draw conclusions about the purity of the sample. Using the built-in absorption calculator with an absorption accessory will greatly enhance the capabilities of your PTI QuantaMaster fluorometer. Quantum yield is one of the most important parameters that characterize photoluminescence of materials. PTI FelixGX incorporates a quantum yield calculator which, when coupled with an integrating sphere, allows you to calculate the quantum yield with ease. The FRET technique provides information about molecular distances, interactions in macromolecular systems, binding, diffusion, sensing, etc. FRET happens when an excited donor molecule transfers its energy to an acceptor in the ground state. FRET is essentially a molecular ruler, where distances are scaled with the Förster critical radius Ro, which is a unique parameter for a given donor-acceptor (D-A) pair, defined by spectroscopic parameters of the pair and their environment. Once the Ro is known and the FRET efficiency is determined experimentally, the D-A distance and the FRET rate constant can be calculated. PTI FelixGX provides an easy and convenient way of calculating all relevant FRET parameters, including Ro. Carbon nanotubes can be characterized using the specially-designed NanoCal within PTI FelixGX. NanoCal analyzes 3-D ExEm spectral maps and returns structural parameters such as the nanotube radius and the chiral angle. Combining this easy-touse software with PTI QuantaMaster NIR options allows for full characterization of SWCNTs. 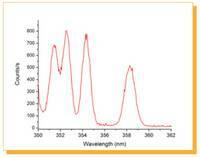 The QuantaMaster series can be easily enhanced with TCSPC fluorescence lifetime capabilities. 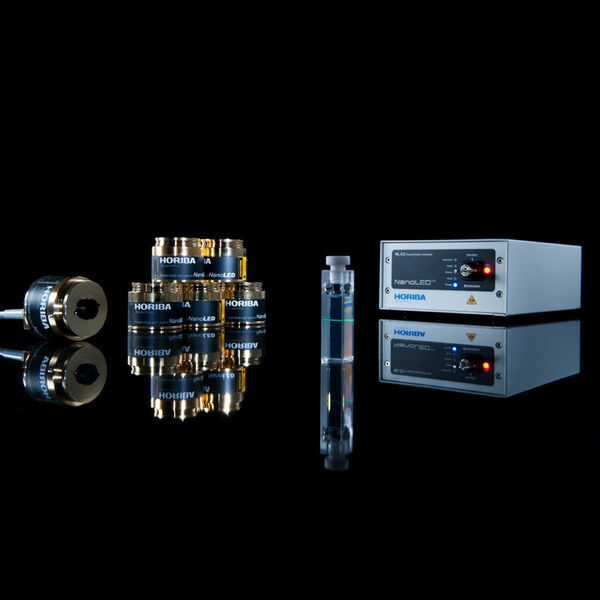 Utilizing world class TCSPC sources, electronics and detectors developed by our IBH group, the QuantaMaster provides the ultimate in speed, versatility and performance. The standard QuantaMaster PMT can be used for these additional TCSPC measurements, or you can add a dedicated TCSPC detector with enhanced performance or extended NIR detection. 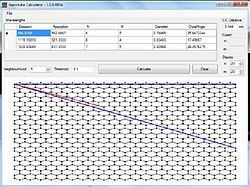 All steady state and time-resolved control, acquisition and analysis are handled by FeliXGX software. Two Systems Can be Better Than One! We also offer very affordable stand-alone TCSPC systems. 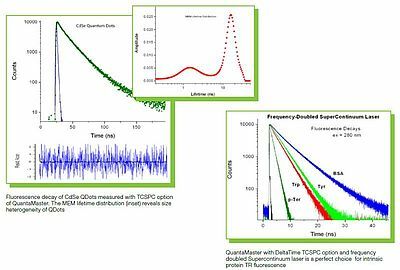 You can increase your labs throughput by having a dedicated steady state fluorometer and a dedicated TCSPC system operating at the same time, for almost the same price as adding TCSPC to the QuantaMaster. Near-infrared (NIR) spectrofluorometry has emerged as a valuable analytical technique, especially in the fields of material research, nanotechnology, chemistry, and photomedicine. 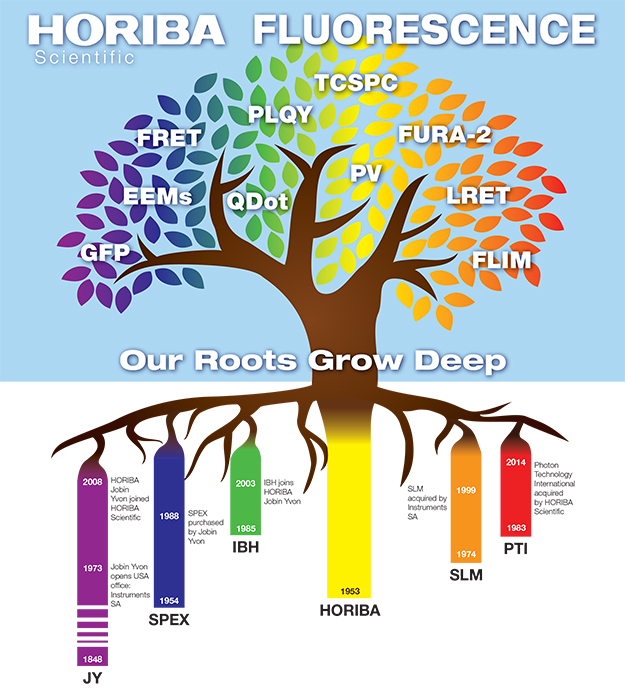 Powerful and diverse NIR capabilities are available through PTI as either a stand-alone research grade fluorometer, or as an upgrade to PTI’s UV-VIS steady state spectrofluorometers. There are different configurations to adapt to any research needs. Additions for NIR Lifetime Measurements to 5,500 nm! 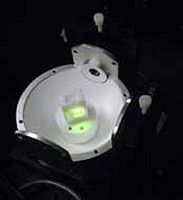 The PTI QuantaMaster series features an open architecture design that provides the ultimate in versatility, allowing your instrument to adapt to your future fluorescence application needs. You can optimize the initial configuration by choosing the light source, gratings, and PMT tubes, as well as a wide array of available accessories. The number of available configurations is virtually limitless! The PTI QuantaMaster universal QuadraCentric™ sample compartment has a spacious design that provides accessibility and can accommodate a wide selection of sample accessories. Choose from sample temperature controllers to various holders for solids, liquids and powders, and many other options. See the Accessories page for more details. The open architecture design also allows for application and methodology changes. As your application needs grow, so can your PTI QuantaMaster. For example, if you develop a need to measure dynamic anisotropy, you can add a second emission channel and a set of polarizers. If you want to complement your steady state data with lifetime measurements, you can do so by adding a laser or LED-based excitation to your initial configuration. If you are interested in intracellular Ca2+ after completing initial Fura-2 studies, you may decide you would like to start imaging the events. 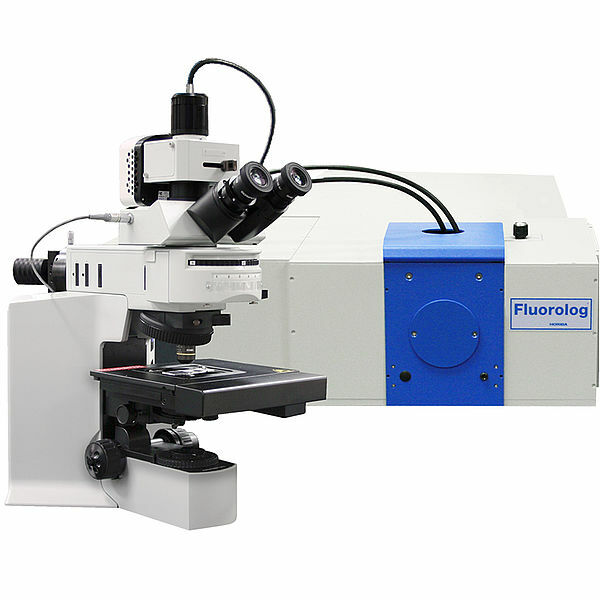 The system can be easily coupled with any fluorescence microscope. Whether you choose to add NIR detection or a second excitation source, the possible configurations are endless. Temperature-induced unfolding of bovine serum albumin (BSA) in PBS (pH=7.4) monitored by fluorescence anisotropy with dual mission channels using a rapid temperature change Peltier option. Both photon absorption and photon emission are correlated in space with the transition dipole moment vector of the molecule. Therefore, a measurement of the fluorescence polarization of the emitted light can yield information about the rotational mobility of the molecule under investigation. The rotational mobility of a macromolecule such as protein or DNA, depends on its size, conformation and viscosity of the medium. Fluorescence anisotropy measurements provide an easy and powerful tool to study conformational transitions, such as protein folding and unfolding induced by temperature, pH changes, and drug or ligand binding. For fast and convenient anisotropy measurements, dual emission configurations are available to allow simultaneous determinations of vertically and horizontally polarized fluorescence signals. A software controlled rapid temperature change Peltier unit is a valuable option for anisotropy measurements. 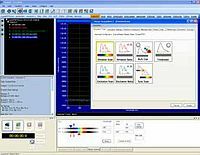 The powerful PTI FelixGX software, with its user-friendly macro programming capability, and the rapid scanning performance of the PTI QuantaMaster, make it easy to create automated acquisition protocols for measuring emission spectra at varying excitation wavelengths, and creating a 3-D EEM characterization of a fluorescing sample. Such measurements enable the user to fully characterize spectrally complex samples very rapidly with minimum personal involvement. This means you save valuable time. The TLS technique is used in various analytical applications of photoluminescence spectroscopy. It is especially useful for detecting and identifying Polycyclic Aromatic Hydrocarbons (PAHs) in environmental samples, as well as in food science to test for contaminants or assess foodstuff deterioration. 3D mapping can then be used to demonstrate the naturally occurring fluorescent components. The data represents a mixture of three organic hydrocarbons: p-terphenyl, anthracene, and perylene. The ordinary emission scan does not reveal the complexity or identities of the mixture. On the other hand, the synchronous scan clearly shows 3 narrow emission peaks located at the emission maxima of the respective compounds, making it possible to identify the mixture components. 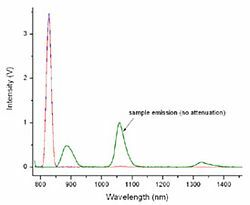 Synchronous Fluorescence Spectroscopy involves scanning the excitation and emission monochromators simultaneously at identical scan rates, with a fixed offset between the two wavelength ranges. 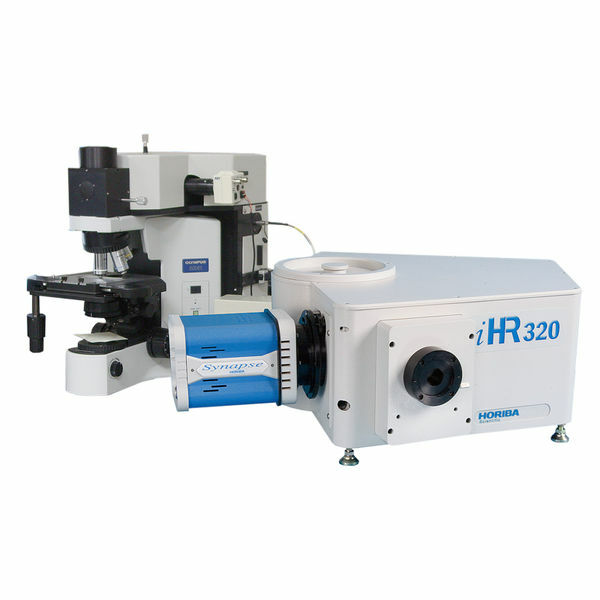 It offers much higher spectral selectivity than the conventional emission and excitation scans, reduces light scattering and improves resolution. SFS is a powerful analytical technique that enables simultaneous determination of multiple components in the mixture. It has been used in detecting carcinogenic Polycyclic Aromatic Hydrocarbons (PAHs) in food and environmental samples. Excitation-shifted probes such as Fura-2 and BCECF are often used in determining intracellular calcium concentration and pH. These probes exhibit an excitation shift upon binding calcium (Fura-2) or protonation (BCECF). In these experiments, the excitation monochromator automatically alternates between two excitation wavelengths corresponding to the free and ion-bound probe. The ratio of the two signals is also measured. Pre-configured look-up tables transform the measured intensity ratio into ion concentrations or pH. Similar measurements can be done for emission shifted probes such as Indo and carboxy-SNARF. Probably one of the most common experiments, time based measurements, are useful for many applications such as enzymatic activity assays, ion activity in cells, titration studies, proteinprotein and protein-drug interactions, anisotropy measurements, and chemical kinetics. The measurements involve monitoring the fluorescence intensity at fixed excitation, and emission wavelengths as a function of time. The PTI QuantaMaster series can do kinetic measurements on a time scale ranging from microseconds to hours or days. The use of the excitation correction unit (Xcorr) greatly improves the signal stability by eliminating any light source intensity fluctuations and drift over time. For best results, time-based kinetic experiments should be conducted at a controlled temperature. 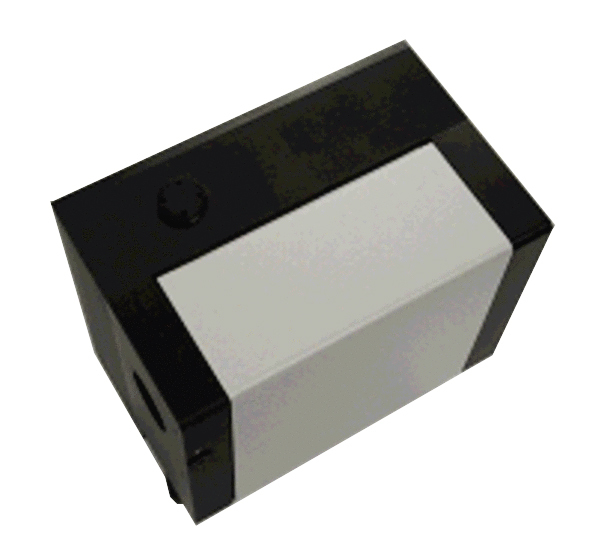 Therefore our Peltier-based rapid temperature controlled cuvette holders, K-155-C or K-157-C, are recommended. If very fast reaction kinetics are studied, a stopped-flow accessory, K-161-B, will be a useful addition. FRET is a popular technique used to study binding, conformational changes, dissociation and other types of molecular interactions. Applications of FRET are especially common in biomedical research involving protein-protein, protein-nucleic acid interactions, protein folding/unfolding, nucleic acid hybridization, membrane fusion and many others. There is also a variety of immunoassays based on FRET. The FRET phenomenon occurs between an excited donor (D) molecule and a ground-state acceptor (A) molecule over a range of distances, typically 10-100 Å. It is a nonradiative process, meaning no photon is emitted or absorbed during the energy exchange. The efficiency of FRET is strongly dependent on the D-A distance and is characterized by the Förster critical radius Ro, a unique parameter for each D-A pair. 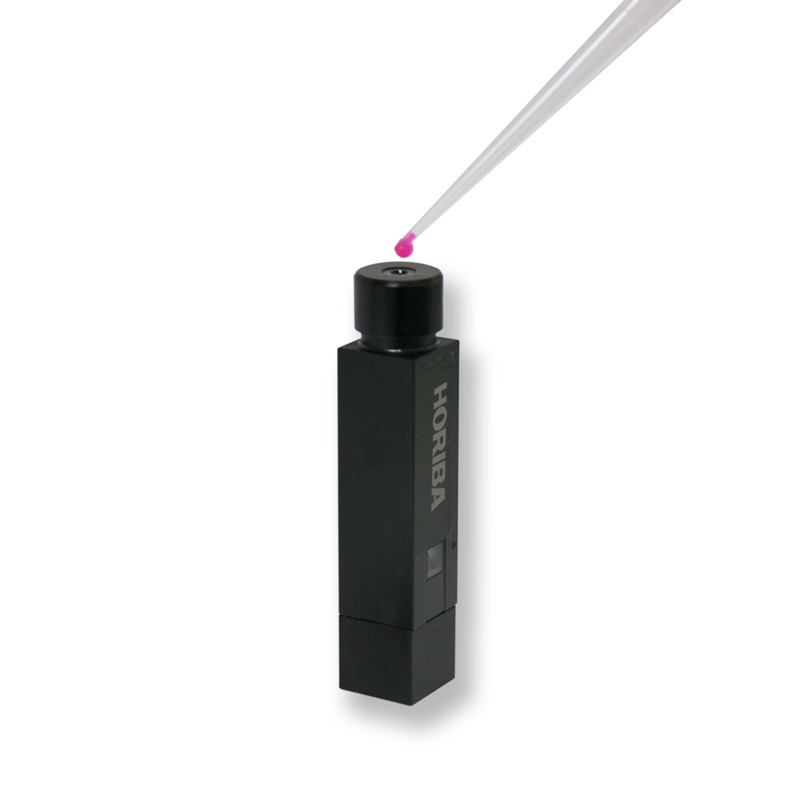 Once Ro is known, the D-A pair can be used as a molecular ruler to determine the distance, or monitor distance changes between sites labeled by D and A. 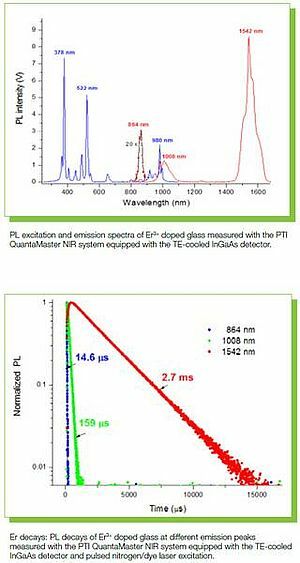 Since FRET is mostly used to study biological systems, where concentrations are often low and samples can be highly scattering, the PTI QuantaMaster is an ideal fluorometer for this application due to its high sensitivity and excellent stray light rejection. It is also easy to upgrade to a lifetime option, which can be very beneficial for verification of the FRET mechanism. The PTI QuantaMaster series will also help you take advantage of this technology with the built-in PTI FelixGX FRET Calculator. Titration monitored by FRET between Alexa-BSA complex and a Bodipy-labeled fatty acid. Sample temperature plays a critical role in all types of luminescence measurements. For example, when the emission anisotropy is measured, the viscosity will change as a function of the temperature affecting the rotational motion of the fluorophore. 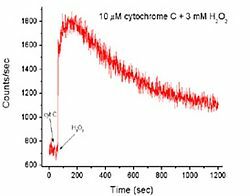 The temperature control can be critical for fluorescence quantum yield determination, or any quantitative intensity measurements since the nonradiative deactivation is strongly temperature dependent. Temperature control is essential in fluorescence studies of proteins as it affects thermal stability of proteins, and their folding and unfolding characteristics. Solid samples, such as doped crystals, glasses, ceramics, and organic molecules deposited on surfaces will exhibit narrowing of spectral lines when cooled to low cryogenic temperatures, thus allowing study of fine interactions. Organic molecules will usually exhibit phosphorescence when cooled to sufficiently low temperatures. The PTI QuantaMaster series comes standard with a thermostatable cuvette holder where the plumbing is already in place for temperature control utilizing a circulating water bath. If your research requires more precise or extreme temperature control, additional solutions are available, including software controlled Peltier-based variable temperature cuvette holders (single or 4 position) and a liquid nitrogen cryostat. 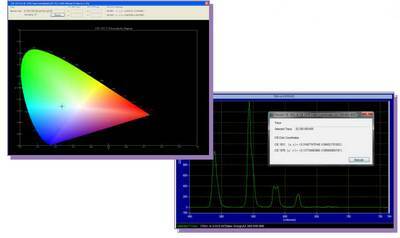 Programmable spectral scans at automatically varying temperatures and temperature ramping experiments are available. Fully automated temperature mapping emission scans of coronene deposited on silica measured in liquid nitrogen cryostat. As the temperature is lowered, the phosphorescence spectrum begins to appear and intensity increases. Phenanthrene at 77 K utilizing a cold finger Nitrogen Dewar Accessory. Fluorescence and phosphorescence spectra measured while increasing the delay time (at 2 ?s increments) for signal integration. A pulsed light source and the ability to integrate the signal at user-selected time delay are dispensable tools in discriminating spectra based on the lifetime of the respective excited state. Fluorescence emission happens on the picosecond to nanosecond time scale, while phosphorescence occurs on the microsecond to second time scale. 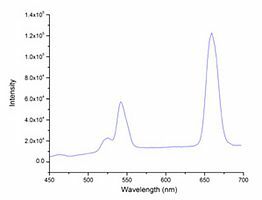 By varying the temporal position and the width of the signal detection gate one can selectively detect fluorescence and phosphorescence spectra as attested by phenanthrene spectra on the accompanying figure. 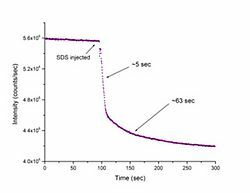 Here, the emission of phenanthrene in a frozen glass was measured with gradually increased time delay of the detection gate to diminish contribution of fluorescence. However, the true potential of this technique can be seen in the case of Room Temperature Phosphorescence (RTP) of RNase T1 tryptophan, where the signal was extracted by gating out the overwhelming Trp fluorescence—a task impossible with a continuous excitation source. 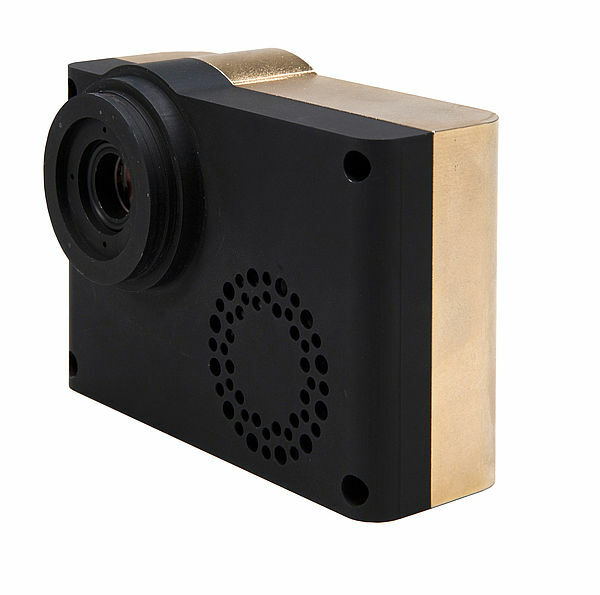 Conveniently, the same instrument can be used to measure phosphorescence decay of this extremely weak emission by using the Single-Shot Transient Digitizer (SSTD) function of the ASOC-10 interface. 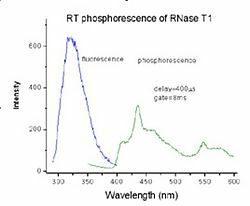 Discrimination between strong fluorescence and weak Room Temperature Phosphorescence (RTP) from RNase T1 tryptophan by varying the temporal position and widths of the signal detection gate on a PTI QuantaMaster equipped with a pulsed Xe lamp and gated detector for signal integration. 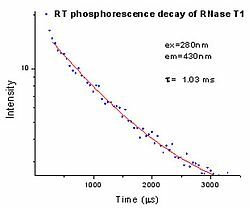 Phosphorescence decay of a weakly emitting RNase T1 tryptophan signal using the same instrument. 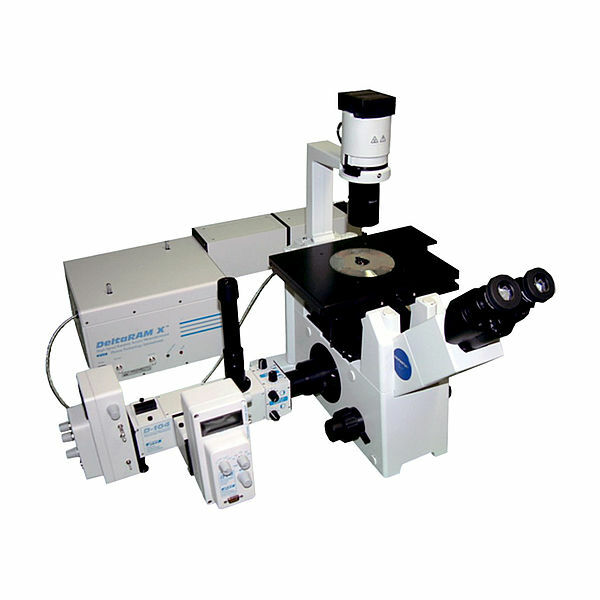 Due to its dedicated accessories, such as a well-designed solid sample holder and excellent stray light rejection characteristics, the PTI QuantaMaster is an excellent choice for semiconductors research. 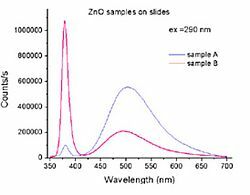 Here, clean spectra from strongly scattering ZnO samples were measured with the PTI QuantaMaster equipped with a double excitation monochromator. *Components, dimensions and specifications vary depending on the specific QuantaMaster configuration and accessories selected. The flexibility of the modular design makes it easy to utilize the PTI QuantaMaster for more specialized applications, such as electroluminescence or photovoltaic measurement. Here, the figure shows an electrical response of a photovoltaic cell illuminated with the PTI QuantaMaster excitation monochromator equipped with an NIR grating. The electrical signal from the cell is fed directly to one of the analog inputs of our versatile ASOC-10 interface, and the powerful PTI FelixGX software takes care of rest! Emission generated by applying different voltages (6V and 9V) to a thin film electroluminescent sample using the PTI QuantaMaster with the electroluminescence accessory. 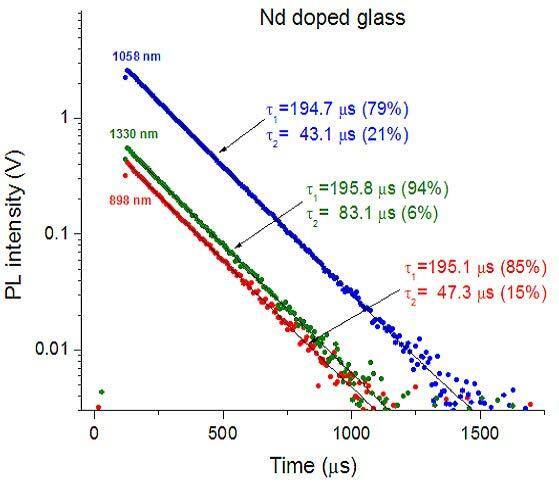 Quantum Yield determination of Nd3+ doped glass in NIR with the integrating sphere and InGaAs detector. 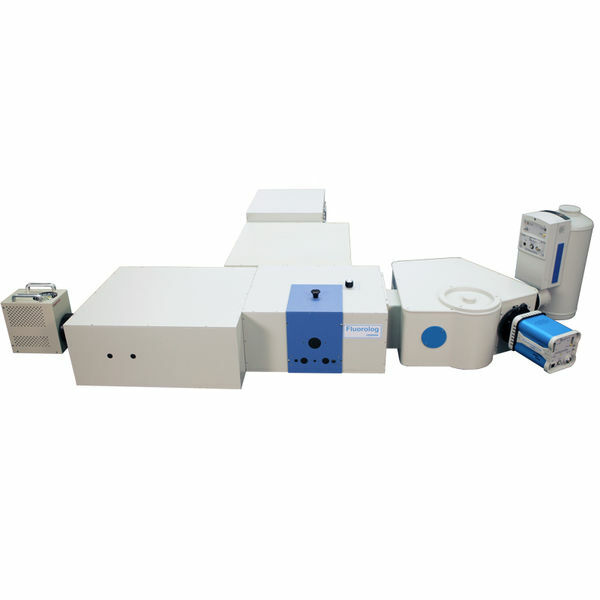 The measurement requires high signal stability and precise emission corrections. 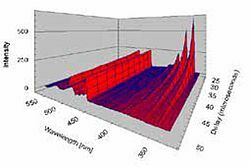 The QY experiment involves emission scanning over the excitation peak, which is usually significantly higher than the emission spectrum. 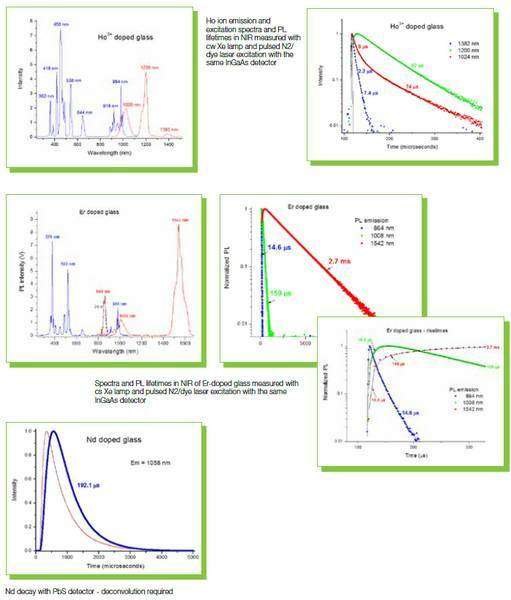 Since the absorbance of the sample is very low, an excellent signal stability, high dynamic range and a linear behavior of the detector are of utmost importance for accurate QY determination. The graph on the right shows the expanded excitation peak with, and without, the sample. Capturing the difference of the two signals is the key to accuracy. 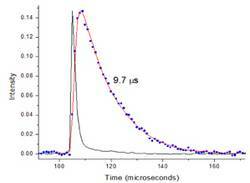 The triplicate experiment showed excellent reproducibility resulting in QY = 0.567 ± 0.017. The applications and interest in NIR photoluminescence have been growing rapidly in recent years. This trend is spearheaded mostly by extensive research in nanotechnology and materials science. NIR-emitting nanoparticles, lanthanide doped glasses and ceramics used in developing new laser media and photonic devices, single-walled carbon nanotubes, semiconductor and electroluminescent systems are only a few dominant applications. There is also a considerable research effort in the optical fiber communication industry to develop infrared molecular amplifiers for the transmittance window at 1550 nm. 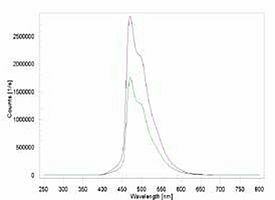 In biomedical areas, there is a trend of using NIR-emitting nanoparticles as luminescent markers due to the fact that the light scattering, a notorious problem in UV-VIS fluorescence measurements, is greatly reduced as the wavelength increases. Less interference means better signal to noise with strongly scattering biological samples. NIR light can penetrate tissue at a much greater depth than the UV and VIS— a definite advantage in tissue imaging and therapeutic applications. In photobiology, the detection of singlet oxygen and development of efficient photo sensitizers for PDT has been the dominant application for years. The continuing introduction of new NIR emitters, coupled with better detection and lower cost systems continues to fuel the growth of NIR luminescence applications. 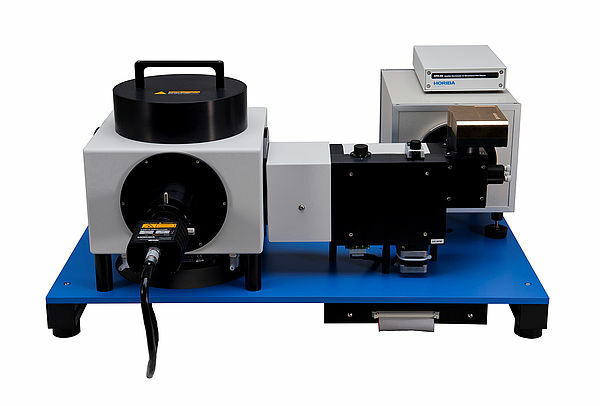 PTI offers an extensive line of PTI QuantaMaster NIR photoluminescence systems with a broad range of options and accessories. The detectors offered include both NIR PMTs and solid state photodiodes that span the range of up to 5,500 nm. 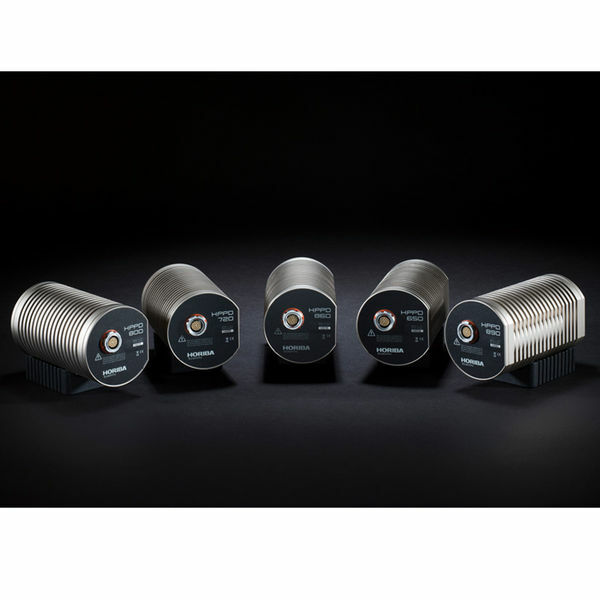 Most of these detectors can also be used with pulsed light sources, thus providing the lifetime capabilities in NIR. Many applications using photoluminescence measurements involve rare earth ions (lanthanides), such as Nd3+, Er3+, Tm3+, Ho3+ and Pr3+, which often emit in the NIR. Often these ions are used with ligand photosensitizers which improve their light absorption properties, as lanthanide ions themselves are very weak absorbers. They are used as dopants in lasing media and glasses, and are made into nanoparticles of varying sizes and shapes in order to control their optical properties. The photoluminescence lifetime (from microseconds to milliseconds) is the key parameter in assessing the optical efficiency of devices involving lanthanides, as well as in quality control during their manufacturing. 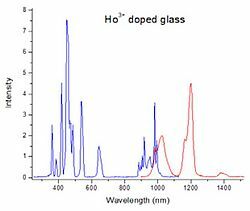 PL emission and excitation spectra of Ho3+ doped glass measured with the PTI QuantaMaster 500, using the TE-cooled inGaAs detector and lock-in amplifier. 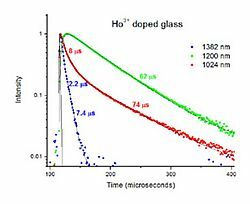 PL decays of Ho3+ doped glass measured with the PTI QuantaMaster 500 system operating in the lifetime mode. Note that the decays are very different for different transitions. The decay at 1200 nm also shows a rise time of 2.4 ?s. Single-walled carbon nanotubes have been one of hottest topics in photonics/materials science in the last few years. There are numerous existing and potential applications where SWCNTs are used, such as microdiodes and microtransistors, computing and switching devices, screen displays, gas sensors, biological sensors (NA hybridization), bio-imaging, drug delivery and many others. Mechanically, they are 3 to 10 times stronger than steel and exhibit high thermal and electrical conductivity. SWCNTs are made of a sheet of graphene rolled along a certain angle (chiral angle) into a tube of diameter r. These structural parameters can be determined by photoluminescence measurements, usually in the NIR range. 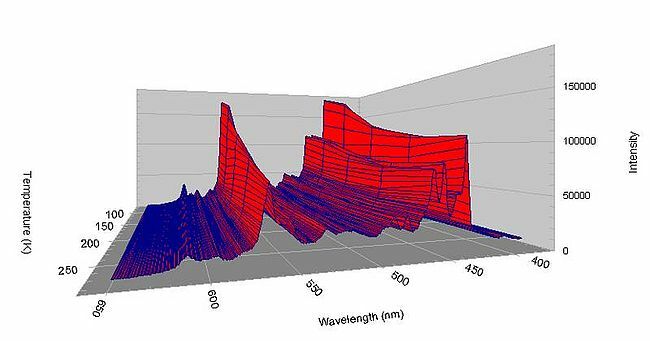 By collecting a 3D excitation-emission matrix and determining the excitation and emission wavelengths of the 3D PL peaks, the structural parameters, the chiral angle and r, can be calculated. 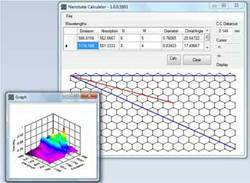 Felix GX provides the Nanotube Calculator which makes this task easy. 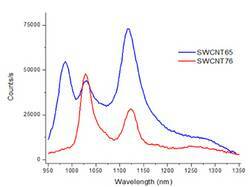 Photoluminescence spectra of two different SWCNTs measured with the PTI QuantaMaster 600 NIR photoluminescence spectrometer. In order to determine the chiral angle ? and the nanotube radius r, a 3-D ExEm matrix needs to be acquired, and the result submitted to the Nanotube Calculator. The use and demand for optical fiber communication has grown rapidly and applications are numerous, ranging from global networks to desktop computers. There have been three spectral ‘windows’ used for optical transmission: 850 nm, 1310 nm and 1550 nm, with the third window now becoming a globally accepted transmission band. There is a need to insert some light amplifiers along the fiber line. One idea of amplifying the signal is based on a chelated Erbium ion. Erbium belongs to the family of lanthanides and has an emission band in the NIR at about 1550 nm, so it matches perfectly the 3rd optical transmission window. The chelating molecules are excited in the UV or VIS by inexpensive LEDs and transfer the excitation energy by FRET to the Erbium center, thus promoting Erbium to its excited state. Since the energy difference between the excited and ground state of Erbium equals the energy of photons (1550 nm) that are propagated along the fiber, these incoming photons will stimulate the emission from Erbium, enhancing the overall signal. 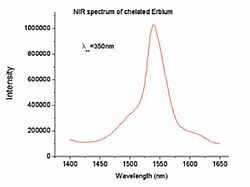 Emission spectrum of chelated Erbium (solid sample) measured with the NIR-PMT and solid sample holder accessory. The system features a thermoelectrically cooled, extended wavelength range NIR PMT operating in the photon counting mode. 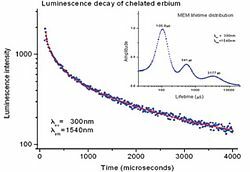 Luminescence decay of chelated Erbium (solid sample) measured with the NIR-PMT system operating in the time-resolved ‘gated’ mode. The decay can be described by a broad tri-modal lifetime distribution, as shown by the MEM distribution analysis—a powerful analysis package from PTI. Singlet oxygen generation and detection are growing fields with applications in such areas as cancer treatment, photosensitized oxidations, and biomolecular degradation. The first excited state of an oxygen molecule is a singlet state, which can readily react with other singlet molecules. Radioactive decay to the triplet ground state is a spin forbidden transition resulting in a long lived excited state. Excited singlet oxygen emits phosphorescence in the NIR at 1270 nm. 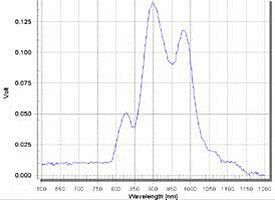 Applications that involve photoluminescence (PL) measurements in NIR have been rapidly growing in recent years. The demand comes mainly from several areas in materials science, such as fiber optics telecommunication, solar energy conversion, lasing media, LED and OLED technologies, and development of upconversion nanoparticles for biomedical analyses and bioimaging. One of the fastest-growing segments of the semiconductor industry is concerned with a new generation of graphic displays for communications and high-definition television sets. 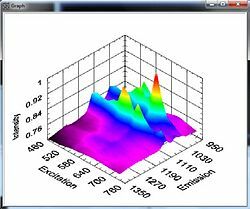 For phosphors that might be used as the active medium in such displays, the critical characteristics are the lifetimes and wavelengths of their emissions.